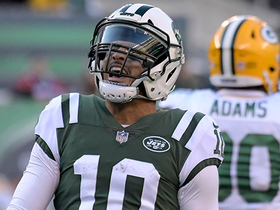 Analysis: Kearse took a major step back after recording career highs across the board with 65 catches, 810 yards and five touchdowns in his first season with the Jets. The interest in Kearse as an unrestricted free agent this offseason is likely to be tepid, and he's unlikely to work his way onto the fantasy radar in most formats regardless of where he lands. Analysis: Nor will Quincy Enunwa (ankle), which sets the stage for Robby Anderson to head the Jets' Week 17 wideout corps, with Rich Cimini of ESPN.com suggesting that Andre Roberts and Deontay Burnett figure to serve as the team's No. 2 and No. 3 receivers in the team's season finale. Kearse, who turns 29 in February, is slated to become an unrestricted free agent this offseason on the heels of a 2018 season in which he logged 37 catches (on 76 targets) for 371 yards and a TD in 14 games. Analysis: What appears to be Kearse's third straight absence at practice this week puts him on track to miss the season finale at New England. 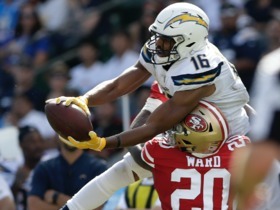 The 28-year-old suffered the injury Week 16 against the Packers and underwent X-rays on Monday. Quincy Enunwa (ankle) has been similarly absent this week, leaving little depth at wide receiver behind top target Robby Anderson. Analysis: The same applies to Quincy Enunwa (ankle), whose chances of playing Sunday against the Patriots seem slim. Kearse's Week 17 availability remains more uncertain, but the fact that he hasn't been placed on injured reserve suggests that his Achilles injury isn't a major one. If Kearse is ultimately ruled out for the season finale, Andre Roberts, Charone Peake and Deontay Burnett could all be in line for more work behind clear No. 1 receiver Robby Anderson. 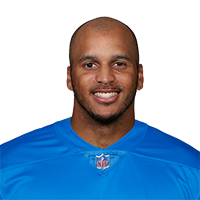 Coach Todd Bowles said that Kearse suffered an Achilles injury in the Week 16 loss to the Packers and would undergo X-rays on Monday, Rich Cimini of ESPN.com reports. Kearse caught all four of his targets for 55 yards in Sunday's 44-38 loss to the Packers. Analysis: Kearse eclipsed 50 yards for just the third time this season. You have to be in a deep league to rely on Kearse's services against the Patriots in Week 17 given that he's found the end zone just once all season. To play devil's advocate, that one touchdown did come in the Jets' first meeting with New England. Kearse caught two of five targets for nine yards in Saturday's 29-22 loss to the Texans. Analysis: Kearse actually finished second on the team in targets behind Robby Anderson's 11, beating out a quartet of guys with four apiece. With almost no big-play ability to speak of, Kearse has had a forgettable season save for a couple of unexpected outbursts. 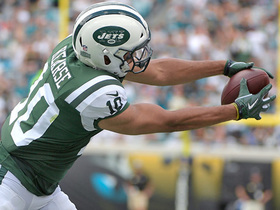 Kearse caught one of two targets for 10 yards in Sunday's 27-23 win over the Bills. 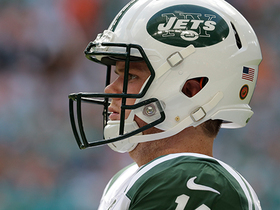 Analysis: Kearse was quiet in rookie quarterback Sam Darnold's (foot) return under center. While this performance left a lot to be desired, Kearse could find himself more involved against the Texans in Week 15 if Quincy Enunwa -- who left this one after aggravating an ankle injury -- is forced to sit out. Kearse didn't have any targets in Sunday's 26-22 loss to the Titans, despite playing 49 of 69 snaps (71 percent) on offense. 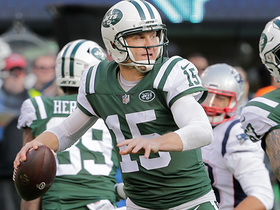 Kearse caught six of 12 targets for 66 yards and a touchdown in Sunday's 27-13 loss to New England. Analysis: Where has this Kearse been all year? 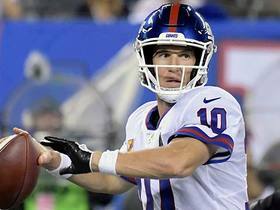 He gave New York a 7-0 lead with a 16-yard touchdown catch in the first quarter -- his first touchdown of the season. Kearse has 15 catches for 160 yards and a touchdown in his two best performances of the season and just 15 catches for 137 yards in his other eight appearances. Chances are he fades back into obscurity against the Titans in Week 13. Kearse caught two of five targets for 16 yards in Sunday's 41-10 loss to the Bills. Analysis: Kearse has contributed to New York's awful performance on offense over the past few weeks. Unless the Jets shake things up and replace the current coaching staff with a more Kearse-friendly regime during the Week 11 bye, the veteran wide receiver is unlikely to be a fantasy factor. Kearse caught three of nine targets for 20 yards in Sunday's 13-6 loss to Miami. Analysis: Kearse led his team in targets, but he failed to do much with the opportunity on a mistake-plagued day that featured a drop over the middle and a missed sideline catch on which he mindlessly stepped out of bounds before bringing the ball in. With Robby Anderson and Quincy Enunwa both making their return from ankle injuries in this contest, Kearse's target share likely will decrease against the Bills in Week 10 and beyond. The "NFL Fantasy Live" crew break down a list of players you should consider starting in fantasy for Week 7. 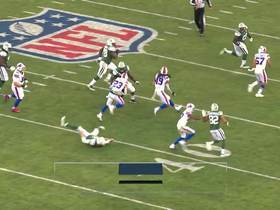 New York Jets quarterback Sam Darnold launches a perfect pass to wide receiver Jermaine Kearse for a 22-yard gain. 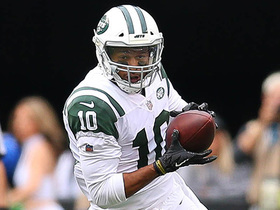 New York Jets wide receiver Jermaine Kearse catches for a 21-yard gain and a first-down. 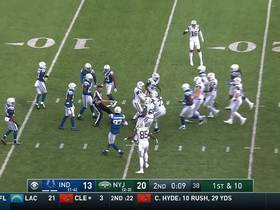 New York Jets wide receiver Jermaine Kearse makes incredible toe tapping catch.